Greta Gerwig - the writer and star of MISTRESS AMERICA - has fashioned a career as a writer and actress playing variations on a certain theme. 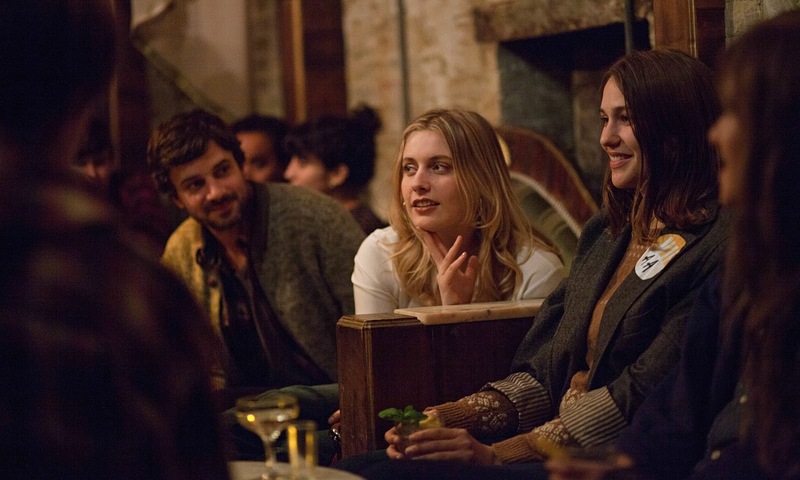 In we start with Whit Stillman's fantastic DAMSELS IN DISTRESS, Gerwig played a character called Violet that should've been insufferable - an arrogant, supremely confidence college student intent on making everybody's life better with her brand of wisdom. And yet there was something so knowingly absurd about her confidence that she became endearing, and I adored the movie. Then we got FRANCES HA, directed by Noah Baumbach, where Gerwig played a similarly eccentric twenty-something girl, but this time so indulged and flaky that I found her irritating beyond endurance. Now we get Gerwig as Brooke Cardinas, the heroine of MISTRESS AMERICA, also directed by Baumbach. She combines the arrogance of Violet with the flakiness and self-delusion of Frances, but somehow the result is a perfectly nuanced and captivating character, and a movie of real substance as well as wit. 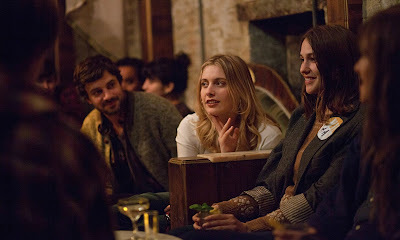 We first see Brooke through the eyes of her stepsister-to-be Tracey (Lola Kirke). Tracey's a geeky lit student at Barnard College, lonely and an outsider, whose only hope was to have fallen in love with her friend Tony before he shows up one day with a girlfriend. On a whim she calls Brooke and is transported into the glamorous hip Manhattan she had always imagined herself inhabiting. It's like something out of a movie - running to a cool concert where it turns out Brooke is part of the band - going to a cool party - crashing the night at Brooke's cool apartment. But pretty soon the reality of Brooke's life becomes apparent. She might seem to be a forever energised and optimistic hipster flitting from cool project to cool project but in reality her emotional and financial life is fragile - and rather than always looking forward she's in fact trapped in a past of resentment and anger. And so we see Brooke and Tracey make the journey upstate to a very swanky modernist house where Brooke can confront her demons in the shape of Mamie-Claire (Heather Lind). The result is a beautifully choreographed and acted 30 minute chamber drama where all the characters are brought together to confront the reality of their own lives, relationships and life choices. To be sure, this is at times a highly self-conscious movie. There's a moment early on where Tracey and Tony are hanging out sitting on a car bonnet looking over the Hudson to Brooklyn Bridge and Tracey says "we look like we're in a movie". Because these are characters who are are hugely informed by literary culture and pop culture and feel authentically modern and real. I also feel that Kirke and Gerwig have real chemistry. We felt them bonding - it wasn't just another cheesy movie girl's night out - and felt upset when they bickered. In fact, I can't say enough about how well this movie is written. It's really something to make dialogue at once so absurd and deliberately witty sound so authentic. I could happily watch a follow-up to this film: Tracey and Brooke five years later. And I guess the weird thing is that thanks to Baumbach and Gerwig's on-going collaboration, we probably will see that film - just badged under a different name. MISTRESS AMERICA has a running time of 84 minutes and is rated R. The movie played Sundance 2015 and was released earlier this year in the UK, Ireland, USA, Canada and Norway. It is currently on release in Brazil and Spain and opens next week in Sweden and Germany. It is also available to rent and own in the USA and UK.